If you are looking for a board game that is easy to learn, quick to play, and a depth of strategy that is easily over looked due to the simplicity of the rules, Splendor is a game for you. In Splendor, the players take on the roles of members of a renaissance merchants guild. The objective is to become the most powerful merchant through the use of beautiful gems and the lands that produce them. Game play is straight forward. On each players turn, they can do one of four actions. A player can take three gems of a separate type, take two gems of one type, provided that there are four or more gems of that type available, buy a development with any combination of gems and developments, or reserve a development card and take a gem that is a wild card. The winner of the game is determined by victory points. There are two ways to acquire victory points. The first is through developments cards. These cards have a cost listed on them and provide both a gem and amount of victory points from none up to five points. There are also Nobles in the game. These are royals that will join the first merchant that has the number of development cards that would entice them. This threshold is listed at the the side of the Noble’s card and each noble is worth between several victory points. The end of the game is triggered when a player reaches fifteen victory points. After that player finishes their turn, the rest of the player who have not had a turn in the round get to go. This is ensure that everyone has the same amount of turns. After everyone is finished, the player with the most victory points is the winner. In the case of a tie, the player with the fewest development cards is declared the winner. 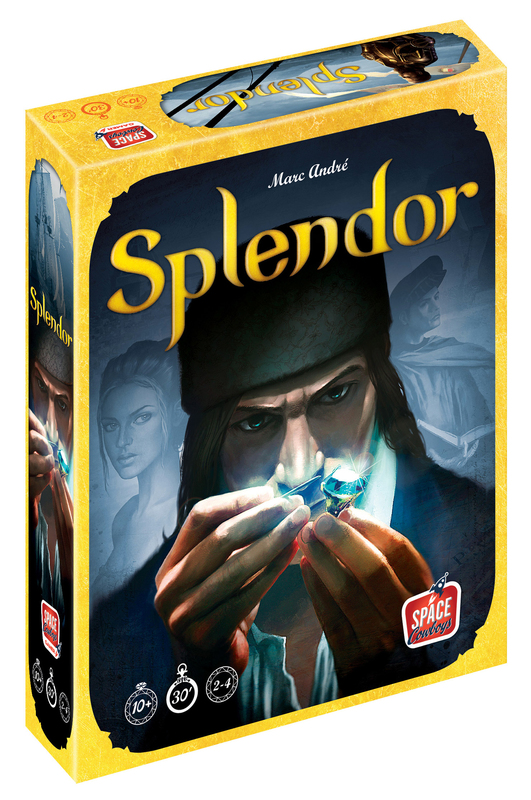 Splendor retails for $49.99 and should be easily found at your friendly local gaming store. I was very impressed with the production values of this game. The illustrations on the cards are beautiful. It was fun to just flip through and look at all of the different art that can be found on the cards. The gem tokens are heavy and tough with makes for a long lasting game piece. The box itself is sturdy and comes with a great tray to organize all the playing pieces and keep them from getting mixed up if you drop the box on it’s side or top. On top of being easy to learn and quick to play, the replay-ability factor is high as well. The different sets of development cards are randomized each game which ensures that any gem can become a choke point in the next game. The Nobles are also randomized so that what is need to garner their victory points will shift from game to game as well. On top of this, each player crafts a strategy throughout the game that can either be fluid or static. This directly impacts what type of strategy the other players are going to use. If one player begins to hoard gems of a certain color or all of them, it pushes the other players to adapt and change course which then impacts the hoarders plans. Splendor is an excellent game for two to four players that takes no time at all to learn and play. It is fast and fun and well worth $50. An excellent addition to any board gamer’s library! 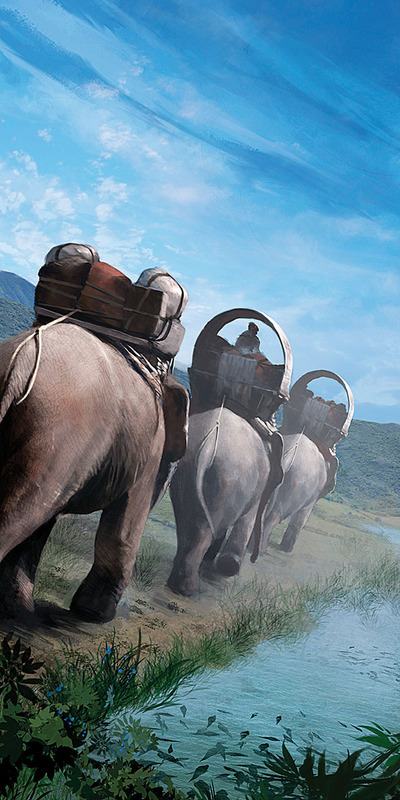 The new Mad Max movie hit theaters this weekend. Honestly, it wasn’t really on my radar but I wanted to see an action movie. So, I rounded up friends and went to see it Saturday evening. I came out of the movie with two realizations. 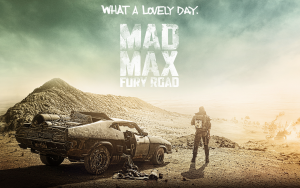 First, I don’t think I have ever seen any Mad Max movie outside of Thunderdome. To be honest, I most probably have not seen all of Thunderdome. Second, I really liked this movie. Mad Max: Fury Road is set in a post-apocalyptic earth where humanity has turned upon itself with it’s nuclear arsenal. The movie takes place in a desert wasteland bereft of identifying information. The location of these last survivors is left to the imagination. Fury Road follows the story of two individuals that refuse to fit into these new societies that have arisen from the ashes of the old. I love how we get to meet Max in this movie. The opening scene gives the view of a person from the back with a car next to them. In the foreground we have a two-headed lizard that begins to wend it’s way towards the lone figure. Once the lizard reaches the figure, it is stomped on and eaten. The audience is given a voice over that informs them about this individual. This is Max. He is a man that has tried to stand up for the things he cared for, and failed. Throughout the voice over, the audience is shown a brief glimpse of these failures. We learn that these failures haunt Max and make it hard for him to discern nightmare from reality. Imperator furiosa is our second rebel whom we do not meet until a bit further into the movie. After the first action few action sequences, the audience is treated to the society of this new world. The have-nots scrabble in the dirt waiting for water from those who have it controlled. The master of the water has created a religion around himself and his family to keep his foot soldiers in line. Furiosa is a trusted lieutenant who is venturing out on a supply run between Gas and Bullet Town. First and foremost, Mad Max: Fury Road is an action movie. From the opening scene where Max is pursues by the warboys and taken prisoner until the last moment when Max and Furiosa return to the citadel and reveal the dead body of the it’s leader, the action is fast and furious. This tension is punctuated by moments of peace as the characters a forced to take stock of their situation and then move forward in some fashion. This is where the action movie tropes seem to fade into the background to create something more. There are a lot of good things going on in this movie. We get an action movie where there is no damsel in distress. Furiosa is taking action to save the brides of the monster in control of the citadel. She is doing this both to save them and to save herself. These brides are, for the most part, not wilting flowers. Each one is capable of assisting in this escape attempt. There are a couple of scenes where survival is predicated on one of them taking action, and they do. There are spots sprinkled throughout that raise the tension due to expectation. There are several points where a bride or another woman is put in a position to be exploited. These scenes play upon this tension and then veer away from the edge of this particular abyss and take us to a different place. This is a violent action movie that is absent the gore that has been the norm for longest time in this genre. There are people shot, ran over, branded, and tortured. Each time a scene like this would normally go full tilt, the camera cuts away to something else. The tension is created by your expectation and the relief is great when the full-tilt gore isn’t thrown into your face. What could have easily been an over-the-top gore fest is transformed into something better. The thing that astounded me the most was that for all the sound and fury that this movie delivers, it has a quiet soul. I know that this doesn’t make sense but it does to me. In a normal action movie, you have the leads exchanging witty or not-so-witty banter. You have extras commenting on the action in the vein of a Greek chorus. There are long soliloquies to explain the world to the viewer. In Fury road, there are very few of these things. The warboys will chatter a bit, and there are points where Furiosa explains where they are heading. The thing is, that these points are few and far between. The dialogue in this movie is sparse and gives you just enough for you to get by. The rest is left for the audience to add from the action that takes place on the screen. The music that accompanies the action of the movie serves to highlight this silence at the core. In particular, the pursuing villains have their own heavy metal war wagon with flame-throwing guitar player. Towards the end of the pursuit, the fight ends up on this vehicle. When the musician is interrupted, one thread of the score falls out. It is subtle but highlights the use of silence that kind of lays at the core of this movie. Mad Max: Fury Road is a study in opposites. It is loud and blusterous as any action movie can be but has silence at it’s core. It is an action movie full of violence and carnage but avoids the shocking and tantalizes with brief glimpses of the grotesque. The name of the movie is Mad Max but the heart of the movie is Imperator Furiosa. All of these contradictions come together to make a great movie. I hope I have time to see it again. 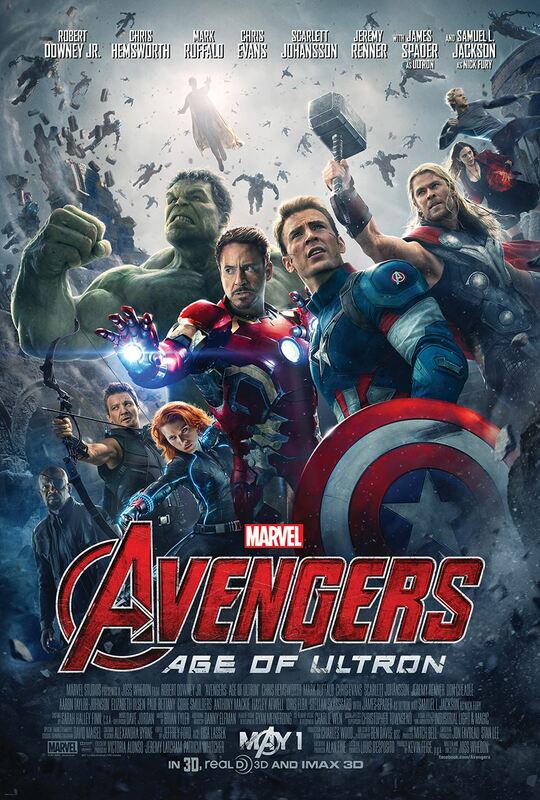 I went and saw Avengers: Age of Ultron twice over the weekend. Once, as part of a double feature with the first Avengers, and the second with friends at the first showing on Saturday morning. Both screenings, I came away enjoying the movie but with this feeling that something wasn’t quite right. I couldn’t put my finger on it though. The movie had plenty of comic books action and witty banter between all parties involved. The stakes were appropriately high and the tension was always well maintained. What was bothering me about Age of Ultron? I was mowing the lawn on a beautiful Sunday afternoon when it hit me. One of the themes that Age of Ultron plays with is the idea that superheroes are monsters themselves. It is not subtle with this theme either. There is a point where the heroes are about to have their final showdown with Ultron. Iron Man states that this is how they show the world that they, The Avengers, aren’t the monsters they appear to be. Each character, save one, is shown to be monstrous. The Hulk is the easiest as his destructive rages are well documented. We get to watch as Bruce Banner and Tony Stark take on the guise of Dr. Frankenstein to create the villain of the piece, Ultron. Thor and Black Widow are shown to be monstrous through glimpses of their darkest fears brought on by Wanda Maximoff. This leaves us with Hawkeye. The only other “normal” member of the Avengers. He is portrayed as the every-man laying at the heart of the team. The audience is even shown that he has kept a family life hidden from the rest of the team to ensure this normality. The trouble is, despite the best efforts of the writers, Hawkeye as the normalizing factor for the Avengers rings false. Somehow, between Avengers and Age of Ultron, it was forgotten that Hawkeye did some pretty monstrous things as a mind-controlled slave of Loki’s. This is only addressed once in the movie when Wanda is messing with the minds of all the Avengers. As she sneaks up on Hawkeye, He spins and slaps a special arrow on her head while saying he has already done the mind control bit. There is a scene where Hawkeye is talking with his wife about the team. She is supportive of him and the choices he has made. She pretty much tells him that he is the heart. It is at this point that I was expecting some call back to the first movie and the horrible things that Hawkeye had done, but there is nothing. The audience is instead treated to his wife telling him to make sure that they have his back as well. This came across as Whedon trying too hard to create this core of normalcy in the Marvel cinematic universe. This setting, the perfect home with 2.5 kids, a dog , and an adoring and supportive wife, feels like the excellent place to show the monstrous nature that is Hawkeye. Here is a master assassin that has also killed innocents while controlled by Loki. Having him face the things that make him as much a monster as the Hulk in the heart of his peace would have been so powerful at that moment and made the actions he takes later even better. I think that is why it bothers me so much that he isn’t treated as a monster like the others and has two of the strongest moments in the movie. The first is during the first part of the fight against the army of Ultrons. He and Wanda are taking heavy fire and retreat into a building as Wanda starts to buckle under the strain. He turns to her in the building and explains the absurdity of the situation. 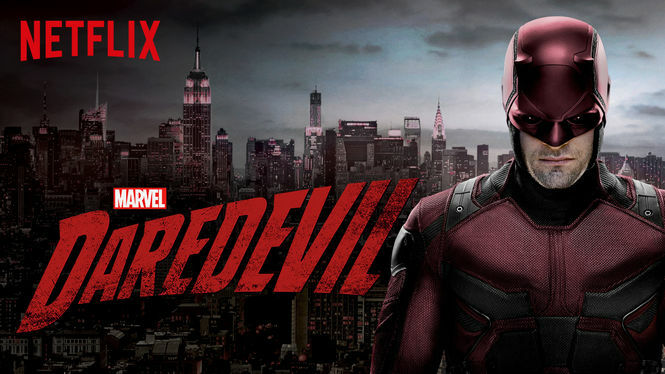 He is here, on a flying city, fighting an army of robots, with a bow and arrow. It doesn’t make any sense but he does it anyway because there are people at risk if he doesn’t. Wanda can stay there and be safe and that is okay, but she can also step out that door and transform herself. She can step out that door and be an Avenger. The second scene is when he is about to leave the city. He spies a child trapped just away from the boat with his mother screaming for him to come to her. Hawkeye heads out to rescue the boy when Ultron comes along in a fighter and strafes the area. Hawkeye turns to shield the boy from the onslaught only to open his eyes and be okay. He looks to the side to see Pietro standing there, riddled with bullets, who then says, “Bet you didn’t see that coming.” Then Pietro dies. In the look that Hawkeye gives Pietro as he drops to the ground in redemption. Pietro has gone from a monstrous villain to a hero in that one look. The scene closes out with Hawkeye collapsing on some seats next to the supine body of Pietro illustrating how far apart yet close the two were at the end. I know I am complaining a lot about this but this doesn’t mean I disliked the movie. Like I mentioned, I saw it twice and will likely see it again before it leaves theaters. The action sequences were well done, the cinematography was beautiful, and the acting was top notch. James Spader as Ultron provides a whimsical flair to the homicidal nature that permeates Ultron without ever becoming scenery-chewing schlock. I just want the things I enjoy to be the best that they can be and feel that Whedon missed the mark in a big fashion with Hawkeye in Age of Ultron.